It’s what you could call a “river of neglect" - a murky mess flowing into the Assabet River in Concord, Massachusetts. "There were things in that water that shouldn't be there,” recalled Alison Field-Juma as she walks the banks of the river. "Clearly there were things coming out of that pipe, and it was clear that those things were from that pipe that shouldn't have been there,” Field-Juma added. Field-Juma is the executive director of OARS, a group working to restore the health of the Assabet River. After hearing of the leaking pipe, OARS immediately alerted the Massachusetts Department of Environmental Protection. Within 24 hours, the department scrambled to test the water near the pipe, which was coming from MCI-Concord. Blue rubber gloves, paper, rags, and plastics were all found near the pipe, according to state documents obtained by necn in a joint investigation with the New England Center for Investigative Reporting. Plus, bacteria levels were "substantially in excess" of state guidelines. DEP ordered the prison to remedy the problem, but four years after the first report, more trouble was observed. Gloves, toothbrushes, and shampoo bottles were found near the same pipe. The lack of DEP oversight and follow up is blamed on budget issues. The state's environmental budget, including DEP, has been slashed nearly 30 percent since 2001. "Because they lost the staff from that part of their office, they weren't able to follow up on it. So it had basically become part of their big back log,” Field-Juma said. In its own report from 2015, DEP acknowledges a "loss of full time monitoring personnel" has strained its ability to test the quality of Commonwealth waters. "If you don't have the state staff to do it, who's going to do it?" Field-Juma wondered aloud. Back along the Assabet, now six years since the leaky pipe was reported, DEP said the problem isn't fixed. It added that bacteria levels have come down in the past few years, however. "That's a waste of resources because these things linger on and on and nothing gets done,” Field-Juma said. The budget issues facing DEP stretch to Cape Cod as well. Decades of pollution in West Falmouth squashed a once thriving ecosystem. "Fifty years ago, it was teeming with life under the water. Lots of bay scallops could be harvested out of West Falmouth harbor. Today, you can't find a bay scallop,” Buzzards Bay Coalition senior attorney Korrin Petersen said. A plan to clean up the water there was put in place in 2008 by the Department of Environmental Protection, but dozens more of those plans are needed in other parts of Buzzards Bay to ensure federal water quality guidelines are met. "We need 30 of them throughout Buzzards Bay, we only have two," Petersen said. The complex plans aren’t easy to come up with, challenging cash strapped DEP. The department said the next Buzzards Bay pollution plan won’t be drafted until later this year, or next year. "The longer it takes for DEP to issue these limits, the worse the problem gets, and the more expensive it’s going to be for the communities to fix it," noted Petersen. She adds that once the plans come out, her organization can step in to help meet the new standards. Right now the coalition is offering partial grants to upgrade 20 septic systems along the water's edge in West Falmouth. The new systems trap the waste and prevent it from trickling into the harbor. 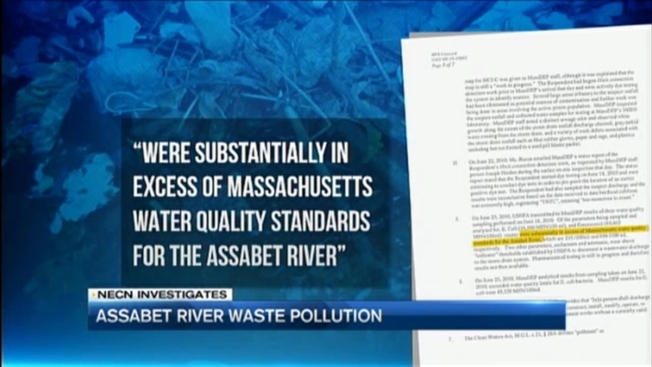 DEP declined necn’s request for a formal interview, but it was recently announced that the Baker administration will allocate nearly $5 million to water quality testing across the state.